Their pioneering work is bringing us closer to a future without the fear, harm and heartbreak of dementia. We’ve also brought dementia research into the spotlight, campaigning for more funding and helping to put the condition not only at the top of the UK’s health agenda, but also attracting attention worldwide. When Alzheimer’s Research UK was founded in 1992 as the Alzheimer’s Research Trust, our mission was to defeat dementia through research. Early work in establishing the charity and bringing in our original trustees and scientists was spearheaded by Dr Sarah-Jane Richards and Barbara Langlois along with Joe Pollock and Dr Martin Weale with support from Kings College London. Shocked by the lack of investment in dementia research, this small team set out to fund the building of a dedicated research centre in Cambridge, a city known as a centre of research excellence. The focus shifted to funding scientists in universities to ensure that as much money as possible went directly into research. We now have a network of 15 centres of research excellence across the UK supporting hundreds of scientists. Our launch at the House of Lords introduced Alzheimer’s Research Trust to the public and set out our mission to fund the best research to defeat dementia. The fundraising event was hosted by Baroness Perry of Southwark. Guests included broadcaster Kate Adie who spoke of the “totally isolating” effect of Alzheimer’s, and actress Nicola Duffett who gave a moving description of losing her father to the disease. High profile supporters like Sir Cliff Richard and Sir Terry Pratchett have played a key role in raising awareness of dementia, and putting the need for research high on the national agenda by speaking about their personal experiences. The late Roland Boyes MP was one of our earliest and most dedicated campaigners, spearheading a fundraising and awareness drive when he was diagnosed with Alzheimer’s in 1995. Roland raised £30,000, which funded an Alzheimer’s imaging suite in Newcastle; his role in parliament and connections also helped boost awareness of the need for research. Roland’s wife Pat Boyes is now an Alzheimer’s Research UK champion, and continues to fundraise and speak out in the media about dementia in memory of her husband. We funded our first major research event, an international symposium at the University of Cambridge, to promote collaboration between research groups and to provide a UK forum for key issues like causes, diagnosis, and treatments for dementia. The symposium paved the way for our annual conference, providing a platform for the dementia research community to communicate its latest findings. In the mid 1990s the limited awareness of Alzheimer’s among medical professionals meant that misdiagnosis was rife. The problem was particularly acute with early-onset Alzheimer’s, with over 70% of GPs reporting in 1996 that they would fail to recognise the symptoms. The early stages of Alzheimer’s were too frequently misdiagnosed as depression or stress. We developed our Alzheimer’s Facts booklet to describe the early stages of the disease and to empower GPs to advise patients better on available treatments and support. Constantly revised as research has progressed, the booklet has been key in helping improve medical professionals’ understanding of dementia. One of our unique strengths is our network of research centres around the UK. In 1997, we shifted our focus from building a bricks and mortar research facility to funding scientists within universities. This meant we could commit as much money as possible to research. The model has served us well, and our revered network – now 15 centres strong – has helped boost progress in the dementia research field since 1997. A Scientific Advisory Board was established in 1997, and set the blueprint for our expert panel of world-leading dementia researchers who award our grants. We have always relied on the experts to direct the research we fund, and our Board boasts 19 top scientists who ensure your money supports the most promising projects designed to make breakthroughs possible. University of Cambridge scientist, Prof Michel Goedert, based at the MRC Laboratory for Molecular Neurology in Cambridge, received our first Major project grant. His pioneering work uncovered how nerve cells become damaged in the brain during dementia. The findings have helped inform years of subsequent research aiming to develop methods of interrupting or preventing brain cell damage. In 1999, we awarded our first PhD grant to Prof Lesley Jones, from the University of Wales, to take on and train up a young researcher. Her study looked at genetic risk factors for Alzheimer’s, a field in which our scientists have become world leaders. Since then, we have gone on to fund dozens more PhD students, to ensure that the new generation of young scientists can become the dementia experts of tomorrow. We won the support of the Daily Telegraph, as their charity of the year, raising a record £320,000 for our pioneering research. Our tenth research project, supporting the work of Prof Simon Lovestone at King’s College London’s Institute of Psychiatry, got underway in 2000. Prof Lovestone’s aim is to develop an accurate and early method of detecting Alzheimer’s using biomarkers – telltale biological clues of the presence of disease. Early detection of Alzheimer’s allows people to prepare for the future with their families, and treatments used at an early stage are likely to be far more effective. A £500,000 grant to the University of Nottingham in 2001 kick-started research into brain inflammation, an area of study that remains important and promising today. Many experts believe that a process of inflammation in the brain could cause the hallmark proteins involved in Alzheimer’s to begin accumulating. Drug treatments that target inflammation could prevent this chain reaction from occurring, and work continues to test this theory across many of our projects. Our work was boosted in 2001 by Sir Cliff Richard, who led a BBC Radio 4 appeal for us. We also welcomed the late Baroness Thatcher and BAFTA award winning-director Sir Richard Eyre as Patrons in the same year. Since then many more high profile supporters have joined us in our efforts to overcome dementia, including the late Sir Terry Pratchett, Fiona Phillips, Seth Rogan, Arlene Phillips and many more. Although Alzheimer’s is the most common cause of dementia, accounting for around two-thirds of cases, other diseases affecting hundreds of thousands of people can also be the cause. In 2002 our Newcastle University PhD student Orla Teahan won a British Neuropathological Society award for her work on characterising the different causes of dementia. Understanding the differences between these diseases is crucial, as they react differently to treatments and affect specific regions in the brain, requiring different approaches to drug development. We commissioned the London School of Economics to investigate the true impact of dementia in England, and the team’s report in 2003 was a watershed moment. Their findings revealed that around half a million people were living with dementia in 1998, and forecasted massive increases as the population aged. While dementia plays out as countless, often tragic, individual stories, we have to be able to demonstrate to government the overall impact of dementia on society to push for fairer research funding. 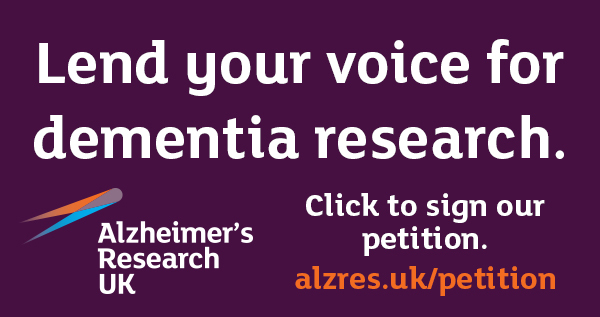 We continue to represent all people living with dementia in our mission to generate greater support for research. In 2004, we introduced our Pilot project grants: essential projects that have become the breeding ground for new ideas and theories ready to be tested. These small, flexible schemes support some of our most innovative projects, opening doors to exciting new areas of research. Since 2004 we have funded over 100 Pilot projects, many of which have gone on to inspire larger studies and trials funded by us, government and the pharmaceutical industry. In 2004 Sir Cliff Richard OBE became a Patron. Sir Cliff had previously led a Radio 4 appeal for us and spoke movingly of the effect that Alzheimer’s has on the person affected and on their family and friends. In 2005 our conference in Nottingham brought together over 100 of the UK’s top dementia research scientists in a unanimous vote against proposals by NICE to deny or heavily restrict NHS patient access to Alzheimer’s drugs. Since that time, and thanks to sustained pressure from us and our partners, we have seen a shift in the ruling, and now people with dementia at all stages can benefit from the drugs we have available. Our innovative Pilot research grants help scientists to test new ideas and bring together preliminary data that can inspire bigger projects. In 2006, Southampton researchers published their work following up on a failed pharmaceutical company vaccine trial. They discovered in their follow up that the two hallmark Alzheimer’s proteins, amyloid and tau, are fundamentally linked. Their findings are shaping our understanding of Alzheimer’s and influencing vaccine trials taking place around the world today. Their important research is one of the most highly-cited case reports in medicine. In 2007, we launched Brains for Dementia Research. Jointly funded by us and Alzheimer’s Society, the network of brain banks across the country collects donated brain tissue for study by our research teams. There are a variety of methods for studying Alzheimer’s in the laboratory, including computer modelling, scanning, cell culture research and clinical studies. However, perhaps the gold seal for studying dementia’s effect in the brain is through the use of brain tissue. We also funded our 40th PhD student in 2007. Training the next generation of scientists is vital for dementia research. Alzheimer’s Research UK-funded researchers from King’s College London revealed that antipsychotic medication, commonly prescribed to people with dementia, can worsen symptoms and double the risk of death when used long term. The 2008 findings were of global importance, with antipsychotic treatments routinely prescribed for people with dementia around the world. Such was the media coverage, and public outcry, that something had to change. Our crucial clinical findings contributed to the November 2009 Government report that pledged to cut the use of antipsychotics by two-thirds, and the high profile ongoing campaign since. Our research has helped bring about change that could save thousands of lives. The late Sir Terry Pratchett donated $1million to Alzheimer’s Research UK in 2008 and also became a Patron. By speaking publicly about his diagnosis of PCA, a rare form of Alzheimer’s, he has helped to reduce the stigma around Alzheimer’s disease and bring it ‘out from the shadows’. Alzheimer’s Research UK scientists discovered two new genes related to Alzheimer’s: the first such breakthrough in 15 years. Over 16,000 people took part in the huge study. The findings were reported around the world and hailed by TIME magazine as one of the most important medical discoveries of the year. The new genetic clues open the door to the next generation of treatment development. Studies funded by us have now discovered over twenty genetic variations linked to the development of Alzheimer’s. These discoveries provide valuable targets for treatment development. The targets are already being exploited, with follow-up studies zeroing in on how the genes might influence Alzheimer’s. In November, our Patron Sir Terry Pratchett presented an Alzheimer’s Research UK petition to Prime Minister Gordon Brown, calling for an end to government underfunding of dementia research. The petition had over 20,000 signatures. Sir Terry also met the Prime Minister with us, who admitted that dementia research had been neglected for too long and should be higher priority. Not only does dementia affect individuals and their families, but wider society too. Our report Dementia 2010 showed that 820,000 people in the UK have dementia, a number forecast to grow to 1 million by 2025. The annual cost of dementia to the economy is £23 billion – more than that of cancer and heart disease combined. These eye opening statistics have helped us push for increases in public funding for dementia research, bringing the promise of new treatments even closer. The Ministerial Advisory Group on Dementia Research (MAGDR) was established in February 2010 to consider ways to increase the volume and impact of high quality dementia research. The group comprised scientists, representatives of funding bodies, charities and industry, as well as people with experience of living with dementia. MAGDR was positioned as a means to bring key interests together to develop shared solutions to common challenges, such as finding more effective ways to research and increasing public engagement. We were instrumental in the foundation and direction of this advisory group. We change our name to Alzheimer’s Research UK and get a striking new identity to help us communicate who we are and what we do more effectively. These changes have improved our fundraising efforts and help us connect better, both with prospective supporters and influential policy makers. We were Iceland Foods’ charity of the year for 2011. They pledged to raise £1million for us to fund Prof Nick Fox’s research team at University College London, which is investigating early-onset dementia. Malcolm Walker, Iceland’s Chief Executive, kick-started the company’s fundraising with a highly ambitious Everest climb. Other events included sponsored walks and a prize draw by X Factor star Stacey Solomon. Over £1.2million was eventually raised during the year. Diagnosis: an early warning system for Alzheimer’s? A study led by Dr Jonathan Schott at University College London’s Institute of Neurology has discovered that changes caused by Alzheimer’s can be detected in healthy elderly people. Patients with a higher level of amyloid in their cerebrospinal fluid also showed a higher level of brain shrinkage in MRI scans. More research is needed but this study has been heralded as a significant breakthrough in the diagnosis of Alzheimer’s. With help from our funding, a global team of scientists discovered a rare genetic mutation that increases the risk of Alzheimer’s disease, in a study with major implications for understanding the causes of the disease. Led by scientists at UCL’s Institute of Neurology, the international team studied data from more than 25,000 people to link a rare variant of the TREM2 gene – which is known to play a role in the immune system – to a higher risk of Alzheimer’s. The Prime Minister’s Dementia Challenge launched in March 2012 and we were invited to celebrate the initiative with high profile media coverage and a special reception at No. 10. We published our Defeating Dementia report, highlighting the quality of dementia research carried out in the UK and how increasing its capacity could help accelerate research progress. We shook up our approach to research with the launch of Alzheimer’s Research UK’s new research Strategy at a high profile event in Westminster. The strategy will see us move faster on treatment development, bringing the academic and pharmaceutical sectors closer together to carry new discoveries into treatments that benefit patients. We welcomed on board a major new corporate partner, The Page Group, which is aiming to raise a colossal £200,000 by covering 200,000 miles in creative ways. The Iceland Foods Charitable Foundation also committed to supporting us for a third year, bringing further major investment into Alzheimer’s disease research. We launched the first ever virtual lab tour designed to help the public understand how new dementia treatments are developed. The Lab has received praise for its innovative approach to introducing the research process to the masses and for its unique design. At a high profile launch as part of the Global Action Against Dementia legacy event in London, we launched Defeat Dementia – a fundraising campaign aiming to raise £100m over five years to power transformational dementia research. The campaign, which won the backing of the Prime Minister, features a number of new world-first research initiatives designed to drive academic discovery more quickly into benefits for people with dementia. As part of our Defeat Dementia campaign, we launched the Stem Cell Research Centre, a collaboration between Oxford University and UCL. The pioneering research centre receives skin cells donated by people with Alzheimer’s disease, which are reprogrammed into stem cells which have the ability to become any other cell type. In the Research Centre’s case, the cells are transformed in nerve cells, creating a cell model of Alzheimer’s disease in a Petri dish. This amazing science allows us to test new treatment approaches for the disease and zero in on promising new molecules. The project has benefited from generous funding from the Alborada Trust. The Defeat Dementia campaign will fund some of the biggest ideas in dementia research worldwide. As well as our new Stem Cell Research Centre, we are also making progress with the Dementia Consortium, which unites the pharmaceutical industry with the most promising drug discovery leads from the academic sector. During 2014, we developed a network of Drug Discovery Institutes to commit dedicated scientific teams to cracking the code for new treatments, and we drew up plans for increased investment in promising clinical trials and prevention work. We helped researchers to buy four essential pieces of equipment, three new PhD students embarked on their careers and nine innovative Pilot Grants were able to get off the ground. New studies included Prof Alan Thomas at Newcastle University who is studying changes in the heart as an innovative way to detect the early signs of dementia with Lewy bodies and researchers at the University of Edinburgh investigating blood flow in the brain in dementia. Research you helped us fund set up 44 new collaborations and we joined forces with other funders like the US Alzheimer’s Association, the Michael J Fox Foundation and the Weston Brain Institute in Canada to fund large-scale initiatives to tackle key unanswered questions in dementia. In October we invested in the UK government’s Dementia Drug Discovery Fund together with the Department of Health and major pharmaceutical companies as part of our strategic work to fast-track the development of new treatments for dementia. Our funding supported over 100 research papers of new discoveries, including UCL researchers shedding light on humour changes in frontotemporal dementia and a team at King’s College London discovering a protein in blood that could predict memory and thinking decline over 10 years. We also joined forces with MRC to launch an ambitious study called Insight 46. The UCL-led project is using state-of-the-art brain scanning coupled with memory and thinking tests to study the risk factors for dementia and the earliest signs of diseases like Alzheimer’s in this unique group of 70-year olds. We celebrated as Prof John Hardy, an ARUK-funded researcher and a Lead Academic Scientist at our UCL Drug Discovery Institute became the first UK winner of Breakthrough prize for life sciences. The award reflected the landmark discoveries he has made over his career linking rare faulty genes to Alzheimer’s and other dementias that have transformed the research being carried out across the world today. Campaigned successfully for dementia to be named a ‘test case’ for the government’s Accelerated Access Review into the way new medicines are made available to patients. With more Alzheimer’s trials making progress, we began a project to understand how future dementia treatments might be taken up by the NHS, in an effort to ensure new medicines reach people quickly. In 2016, Alzheimer’s Research UK joined forces with Deutsche Telekom to launch Sea Hero Quest, a smartphone game where two minutes of play equates to five hours of dementia research. This fun game was designed to help researchers learn more about our spatial navigation to inform new diagnostic tests for Alzheimer’s. It and has now had over 2.7 million players, generating over 9,400 years’ worth of dementia research! This year, we were proud to become a founding funder of the UK Dementia Research Institute, a landmark £250m investment in dementia research. The institute, made up of 6 networked centres at universities across the UK, aims to bolster discovery science in dementia on an unprecedented scale. Alongside our major strategic and response-mode initiatives, the UK DRI forms the cornerstone of a national and international research efforts to transform the lives of people with dementia. Fronted by Dr Who actor Christopher Eccleston, #sharetheorange became our most successful digital awareness campaign yet. It had a simple message: dementia is caused by diseases, and diseases can be defeated through research. Nearly 12 million have watched the film, spreading important messages to tackle the stigma around dementia. We fund our first grant through our Global Clinical Trials Fund, awarding £155,000 to researchers at the University of Oxford to investigate the effects of aspirin and omega-3 fatty acids in people at high risk of dementia. We support Public Health England to develop a pilot programme for the NHS Health Check for over-40s, introducing dementia risk reduction information for people in mid-life – an important window for taking steps to protect brain health into later life. Our Dementia Statistics Hub, developed as a one-stop-shop for up-to-date facts and statistics about dementia, was launched in March to provide a vital resource for those seeking to understand the condition and its impact on society. Our ‘Quick Guide to Dementia’ was made available in Polish, Welsh, Arabic, Gujarati, Urdu, Bengali and Punjabi. This was the start of a wider project to ensure that information about dementia is easily accessible to everyone who needs it across the country, in a format and language that’s right for them. Our Keeping Pace report showed a doubling of UK dementia researchers as well as scientific publications over the past six years. Despite this clear progress, the report sets out actions that government and funders still need to take to keep up this momentum. Our ‘Santa Forgot’ Christmas campaign challenged misconceptions about dementia and urged people to support research. Narrated by Stephen Fry, the bold animation imagined what Christmas would be like if Santa had dementia. It reached nearly 14 million people online, drove conversations and debate about dementia across social media and was named the year’s best Christmas ad by PRWeek readers. We joined forces with the Wellcome Trust, seven universities and four pharmaceutical companies to become part of the £8m Neuroimmunology of Mood disorders and Alzheimer’s disease (NIMA) Consortium. This collaborative effort is investigating whether diseases like Alzheimer’s and mood disorders such as depression could be treated by targeting the immune system, which is believed to play a key role in both conditions. Fronted by actor Bryan Cranston, the second chapter of our award-winning #ShareTheOrange campaign brought new understanding about dementia to more than 7 million people across the world. The moving film, produced by Aardman Animations, showed how dementia impacts upon people’s lives, memories and relationships. In September, we launched ‘No time to lose: An action plan for dementia’, outlining five actions the UK government can take to improve the lives of people with dementia by 2025. First and foremost, we asked government to increase investment in dementia research to 1% of the total annual cost of dementia to the UK economy by 2025. We launched a new evolution of the Alzheimer’s Research UK brand – Make Breakthroughs Possible. Following a year-long review of our branding which included engagement with staff, supporters, the public and people affected by dementia, we updated our brand to better reflect the hope, momentum and determination we have to deliver life-changing breakthroughs for people with dementia. Shaping attitudes towards dementia is critical if we are to make breakthroughs in research possible. In February we launched Wave 1 of the Dementia Attitudes Monitor to provide an overview of the UK’s understanding of, and perceptions towards, dementia. The Monitor was based on a survey of 2,361 adults in the UK and will be repeated every two years, enabling us to track public attitudes to dementia and research over time and ensure that our communications reach the right audiences with the right messages to change lives. More than 500 researchers came together in Harrogate for our three-day annual Research Conference – the largest annual meeting of its kind in the UK. The 2019 conference saw research experts from all disciplines share the latest findings and ideas for tackling dementia. Scientific topics covered all four of our goals – disease understanding, treatment, accurate and early diagnosis and risk reduction and prevention. See our vision for the futureWe believe in the power of research to change the future – and make dementia a thing of the past. Find out how we plan to do this. Fundraising ideasStuck for ideas on what you could do to raise funds to make breakthroughs possible?